Government regulations have required automobile manufacturers to factory install, built-in top tether anchorages, in all new passenger vehicles built after September 1, 1999. Toddlers over one year old and weighing 20 pounds can sit facing forward in either a convertible or forward-facing only seat. The purpose of the top tether strap is to better stabilize the car seat and reduce the potential for the head to move forward, thus lessening the likelihood of injury in a collision. Almost all new car seats manufactured after September 1, 1999 come equipped with a tether, which is a strap attached to the back of a child seat with a hook for connecting to an anchor bracket in the vehicle. 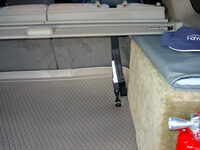 Although 1999 4Runner's were manufactured before the regulation enactment date, Toyota has provided a pre drilled and threaded hole on the cargo area floor for use in mounting a top tether bracket. 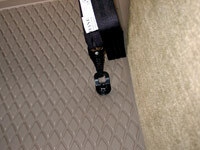 You can lift up the cargo mat and carpeting and look for a hole which will have a round white piece of tape covering it. It is approximatly 28" from the rear cargo opening and 15" to the right/left of the center of the vehicle. 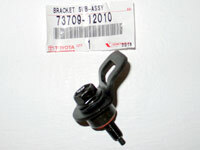 The Top Tether Bracket Kit which includes the bracket, mounting bolt and spacer is Toyota part # 73709-12010. Using a razor blade make an 'x' cut through your cargo liner/mat/carpeting/padding and torque the bolt/bracket with a 14mm socket to between 13-18 ft/lbs.